Our collection contains a variety of paper archives and object collections. Our paper ﻿archives include personal papers from well-known residents and artists of the Ardens, historical documents from all three towns, and other materials that relate to the history and life in the Ardens. We have the privilege of owning numerous artworks, sculptures, furniture pieces, textiles, and other objects crafted by Arden artists and artisans in addition to pieces related to the history and life in the Ardens. Appointments for in-depth research should be made at least one week in advance. ACSM is open to the public and to researchers on Wednesdays from 7:30 pm-9:00 pm and Sundays from 1:00 pm-3:00 pm, and other times by appointment. We will attempt to accommodate researchers who have not scheduled an appointment if sufficient staff is on hand. The request must state the purpose of the visit and must be approved by a Museum & Archives Committee member or the curator prior to the date of the appointment. A museum staff member or Museum & Archives Committee member will provide all materials requested and remain with the researcher at all times. No objects or materials (art, artifact, written material or photograph) will be removed from the collection for any reason by any person without prior approval by the Museum & Archives Committee. Where possible, copies or digital copies of archival material will be presented to researchers. 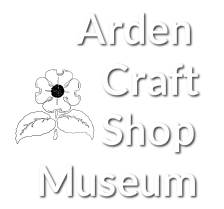 All researchers wishing to photograph any object or material (art, artifact, written material, or photograph) will be required to sign a form that states that all images and original text remain the property of the Arden Craft Shop Museum and that all papers written will properly acknowledge and credit the Arden Craft Shop Museum. Before publication of any paper, book, or periodical, we strongly encourage that the work be submitted to the Arden Craft Shop Museum for review, clarification, or correction. We strongly encourage that a copy of all papers, books, or periodicals written (published or otherwise) using material from the Arden Craft Shop Museum be donated to museum to be accessioned to the museum’s library. For more information, please see our Schedule of Fees, Request for Reproduction, and the "Access and Use" section of our Collections Policy.